Pharmaceutical SOP Reference from C.H.I.P.S. 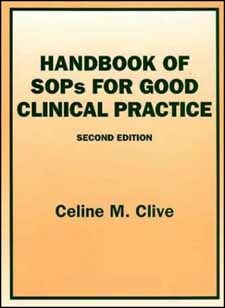 Completely revised and updated, the Second Edition of a classic reference, Handbook of SOPs for Good Clinical Practice provides templates of SOPs ready for adaptation to your requirements and immediate use. This allows you to create new SOPs or benchmark your existing SOPs against an internationally accepted set of SOPs. The book includes a CD-ROM containing an electronic copy of each of the SOPs and forms in the handbook so that you can easily customize the text to reflect your organization's processes. The author uses language ranging from the specific to the very general, depending on the activity described and the number of the existing regulations governing the activity. This provides you with a starting point for the development of your organization's SOPs, saving you the time and money that would normally be spent researching and documenting each of the procedures described. Modifying the SOPs supplied by this book will be a much more efficient task than developing new ones from scratch. Containing templates for SOPs and forms applicable to sponsors, study sites, and Institutional Review Boards (IRBs), Handbook of SOPs for Good Clinical Practice, Second Edition gives you the tools needed to develop effective SOPs for your organization.